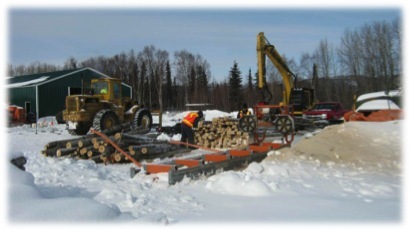 After returning from the training in Washington, I (Mark Leary) spent an additional three days in Anchorage purchasing and shipping additional supplies for the project. This included things like food, steel for the log skids, parts, and assorted oils, grease, etc. needed for our equipment. The start-up expenses for this project have been great. A lot of it was anticipated, but some of it wasn’t like the several thousand in spare parts for the harvester that we purchased in Washington following the recommendation given at the training. We’ve also been getting a hard lesson in the cost of shipping freight to Rural Alaska. Fuel surcharges are higher than ever. The lowest I could find was 29%. So for every dollar we spent shipping freight, we pay an additional $0.29 in fuel surcharges! The week of March 12 we all came back to Napaimute to do preparations for the harvest. Our first priority was to transport over 9,000 pounds of freight from Aniak to Napaimute. Besides all of the things I personally shipped from Anchorage, there were items that had been previously ordered. This included things like: tire chains for our equipment, steel banding, oxygen & acetylene for our cutting torch, batteries and a port-a-potty. 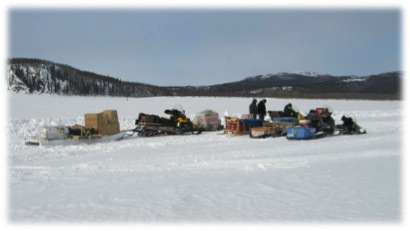 We intended to move all of this freight by truck – the cheapest and easiest way – but the snow is so deep this year – it would take a plowed road on the River so we spent time measuring the ice and marking the route for plowing. We tried plowing the road, but first the grader broke down. Luckily it broke down right here at Napaimute and not way down the River somewhere. 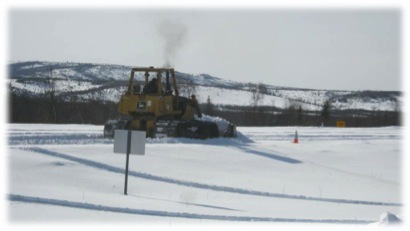 Then we started to plow a simple one lane road with our little dozer. The dozer made it down to just above Anita’s (about 12 miles) before it broke down too. We have since fixed it and brought it back to Napaimute, but each break down is another expense. After all of this trouble we ended up hauling the freight by snow machine and sled. The whole crew went down and got most of it in one trip. I went back a couple of days later and moved the last 3,500 lbs in one load. It was hard on the snow machine but it got done. With all of the supplies in Napaimute we could now work on getting ready to do the harvest. 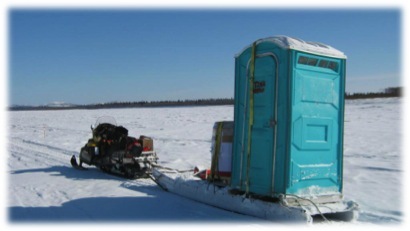 One of our crew was dedicated to hauling additional fuel from Aniak – 100 gallons a day by snow machine. We burned up a lot of our fuel plowing out everything around here: the runway, the road on the beach, etc. and starting to realize that this wood harvest was going to take longer than planned, we needed additional fuel. 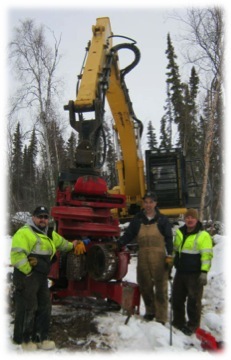 After breaking for the week end, our crew went back to work on March 19th. I was in Bethel intending to return on the 20th (the trip to Bethel is too long to just stay for 2 nights). The guys called on the afternoon of the 19th to report that trying to work was just a waste of Napaimute’s money. It was minus 30 in the morning. They were spending all their time just warming up equipment and trying to get it started. We decided it would be best to hold off and everybody returned home. It turned out to be a good decision as the rest of the week was even colder. Loading up all of the necessary support supplies and equipment for the move down to the harvest site. Moving down to the harvest site was a major job in itself. Between the deep snow and a couple of break downs (more expense) it took us the better part of two days to move everything and set up the camp. Native Village of Napaimute, Alaska | Powered by Mantra & WordPress.